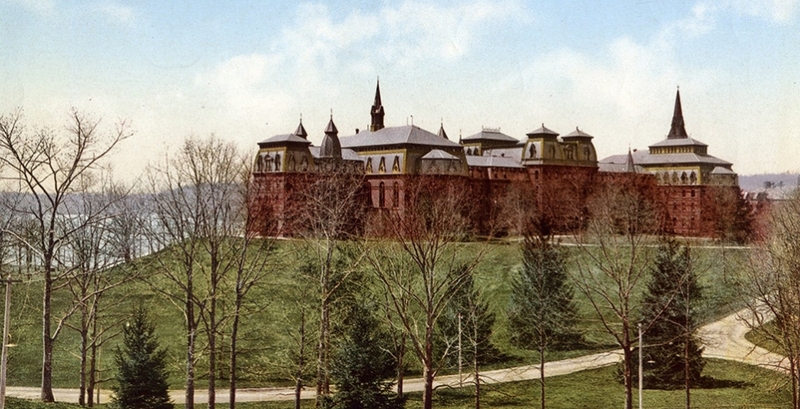 Until March 17, 1914, Wellesley’s splendid College Hall was the heart and soul of the College, housing students, faculty, staff, classrooms, laboratories, art, and more. When Wellesley opened in 1875, to all eyes it was magnificent. Erected on the rise above Lake Waban, its single building was surrounded by 300 acres of a country estate with varied terrain of hills, woods, meadows, and water. The building itself was of immense size. At 475 feet in length, and rising four stories with five-story towers, it was one of the largest buildings in the United States at its opening. And it was exactly as [founder Henry] Durant wanted it—the perfect expression of the College Beautiful. Indeed, for 39 years, College Hall was Wellesley. That immense presence overlooking Lake Waban took four years to build. But early on March 17 one hundred years ago, it took only four hours to burn. At 4:30 a.m., up on the fourth floor in the west wing, Miriam Grover, class of 1914, was awakened by a strange crackling sound and an eerie orange light through the transom above her door. As Grover got out of bed, her roommate, Jinny Moffat, told her to go to Olive Davis 1886, the director of halls and residence. … Miss Davis instructed Grover to alert Edith Tufts 1884, the registrar, on the floor below. By the time Grover spoke to Miss Tufts, the Japanese gong had been sounded, and students were beginning to congregate at their assigned spots…. Because the student fire chief in 1913 had insisted on unannounced nighttime fire drills in each dorm (against the advice of the College physician), many students assumed the gong and the subsequent electric corridor bells were signaling another drill and went about their usual routine of closing their windows, turning on the lights in their room, throwing on a robe or kimono and slippers, and heading down to their assigned meeting spot in the Centre. By all eye-witness accounts, calm and discipline ruled the day, with no “outcry, lamentation, or questioning” slowing down the process of getting everyone out safely. Which they did. Stunningly, no human lives were lost. The April 2, 1914, issue of the Wellesley College News—digitized and readable online now—had extensive coverage of the fire. Wellesley student Barbara Bach Phipps 1916 compiled a photograph album documenting the destruction by fire of College Hall, which is also in a digitized form in the College Archives. In the aftermath of that morning 100 years ago, Wellesley would be forever changed, both by the buildings that replaced College Hall—seven in all, the last of them opening in 1931—and by the response of Wellesley’s graduates and faculty members. "This fire fused the alumnae body together," says Andrew Shennan, provost and dean of the college, who adds that much of what the college has succeeded in becoming can be traced to the fire. As the one hundredth anniversary of this dramatic and course-changing night arrives, Wellesley honors the heroism and grit of the women who survived the fire, saving each other and many assets from the burning building. We honor them further and take inspiration from their resumption of the spring academic term only three weeks later. The success of the rebuilding effort wasn't always a foregone conclusion. After the flames destroyed College Hall, the heart and anchor of the campus, college leaders faced a crucial decision: Should they cut their losses and shut down the school, or attempt to raise more than $2 million—the equivalent of about $47 million today, according to one Wellesley economist—in just months to keep the campus going? We know the answer to that question now, of course, and its lasting effects. The adaptability and resilience, resourceful fundraising, and longer term thinking by undergraduates, alumnae, faculty, and College leadership, supported by the generosity of other institutions and philanthropists, made Wellesley what it is today. Although no one was hurt, and many objects were saved by students and faculty as the fire burned, much was lost on March 17, 1914, and College Hall was left in ruins. Students, faculty, and staff gathered in the Houghton Memorial Chapel that morning, and then the students were sent home for three weeks while the College began the process of recovering from the devastation. Breakfast, music, and address by the president in Houghton Chapel, 8-10 a.m. Tea and exhibition opening (see below) with remarks from curator and provost in the Davis, 3-5 p.m. Learn more about the events of the day, and follow the hashtag #GreatFire1914 on Twitter. Running in the Davis from March 17-July 20, 2014, and co-curated by Professor and Chair of the Art Department Jacqueline Marie Musacchio ’89 and Provost and Dean of the College Andrew Shennan, this exhibition includes objects and documents from the Davis, Archives, and Special Collections, as well as loans from the alumnae community. It examines art and life in College Hall from the founding of the College in 1870 to the great fire that decimated the building and its contents in 1914, to the fundraising and rebuilding efforts that followed. The exhibition focuses particular attention on Anne Whitney's 1883 statue of sociologist Harriet Martineau (Gift of Mrs. Wilson Payne (Elizabeth Rogers, Class of 1926)), a sculpture with a surprising role in the life of College Hall and a fascinating history. This exhibition is free and open to the public, and is generously supported by Wellesley College Friends of Art, Wellesley College Archives, and the Office of the Provost and Dean of the College.